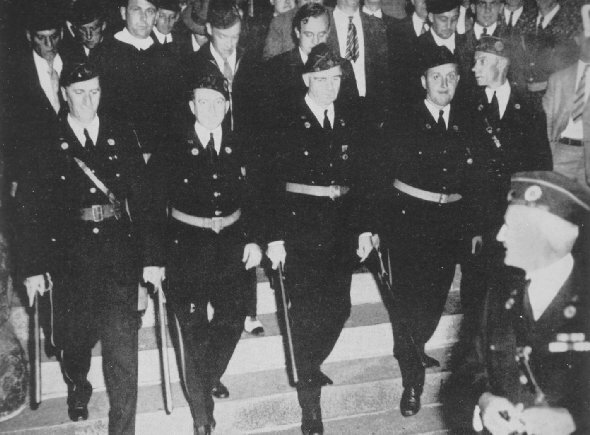 Veterans of the World War quickly responded to the call by the authorities to patrol the strike areas and protect the lives of children during the crisis in the textile strike (1934) following the bloody conflicts in Saylesville, R. I.
to enlarge the police force, and for the States to call out the National Guard, thereby increasing the tax burden. In Rhode Island during the textile strike of 1934, it was necessary for the organized Ex-service men to patrol the streets for the protection of the lives of the children. The ideology which Foster proposes for America and which is supported by a large number of native-born Americans is Russian. In Russia, private property and religion have been abolished. By wiping out income-yielding property and religion, the two strongest supports of the family have been taken away. Marriage is not by ceremony but by registration; divorce, not by trial but by request. The family is no longer a spiritual or economic unit. The communist never thinks or tolerates discussion of family tradition, prestige or exclusiveness. "Family pride," "first family," "old family," "fine family," "famous family," are forgotten terms because no family has a right to make tradition or perpetuate its purpose. Social dining-halls have taken the place of the family table; community nurseries take care of all babies and young children. The principal of the Russian school must be a member of the Communist Party. He is usually a worker selected by the trade union and is, in reality, the political supervisor whose duty it is to see that there is "no perversion in the Party line." Children of the former merchant class, former nobility or "capitalist" are vigorously barred from the schools. Communism is one of the most "touchy" subjects coming up for discussion in the schools. The Communist Party has a place on the ballot. Students have a right to inquire about Communism. Democracy rests on the theory that citizens can and will think for themselves. The function of the American schools is to teach students to think. Socrates said that the one thing he knew positively was that we were under a duty-to inquire. Inquiry involves the discussion of all important problems and of all logical points of view. In directing inquiry into social problems, instructors are bound to run into prejudices and fears. Parents and citizens are on the watch. Various factions in a community frequently misunderstand the motives behind a discussion of Communism in the Social Science classes, which creates trouble for the faculty. It is hard to separate the wheat from the chaff, in the vast amount of literature dealing with this doctrine. The United States Government has spent $55,000 on its two investigations. The investigating committees, with their power to subpoena persons and records, were able to establish the indisputable facts. Instructors cannot be criticized for teaching from these government records. Pupils who are alert will investigate. If their inquiries are ignored in the classroom, there is grave danger of their acquiring a great deal of misinformation through questionable sources.